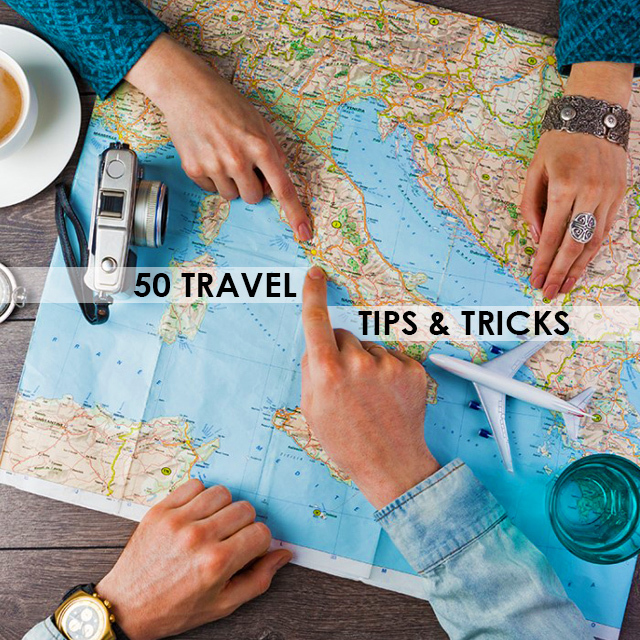 Here are our 50 travel tips & tricks that will come in handy on your journeys. Be sure to use them while exploring the world so that you will get the most out of your travels! 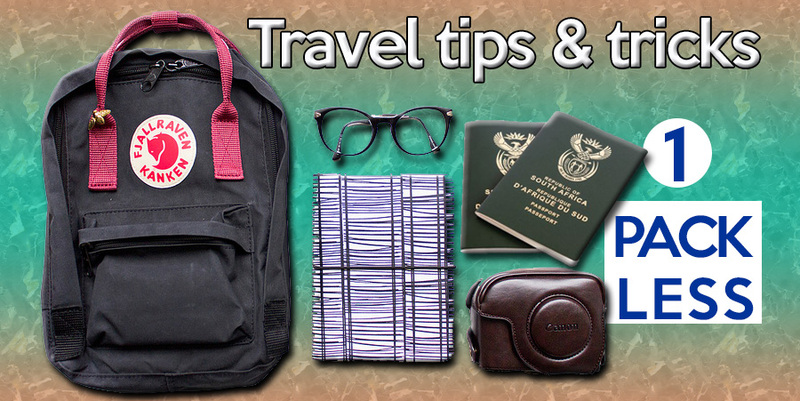 Traveling with just hand-luggage should be your goal. Do you really need six pairs of heels, tea bags, and an iron? Take less and you’ll travel cheaper (no check-in luggage fees), travel faster (no waiting for your bags), and travel easier (one bag means less to lug around). If you get the choice of plane seat, always sit far away from: babies, groups of friends who will chat, or women (men tend to need the toilet less often than ladies). Memorise a handful of words of the local language, and have the courage to use them! It’s amazing how just a few words will go a long way; locals tend to warm to those who have made the effort to communicate with them in their own tongue. Traveling all by your lonesome might seem daunting at first, but it gives you a chance to really immerse yourself in the travel experience. I’ve met friends for life, learnt a new language, and had amazing experiences by traveling solo. They may have become the uniform of unruly teenagers, but hooded tops make excellent travel garments. Just slip up your hood to retreat from the world of noise and light when you want to sleep on a flight/airport seat/bus. If you’re flying long-haul, pre-book yourself into an airport lounge. There’s an up-front fee, but it provides a quiet environment with complimentary drinks, food, magazines, newspapers, Wi-Fi etc. When you leave the lounge, take a few big bottles of water. It’s a cost effective and relaxing way to start your journey. If traveling for a long time, take your own device that can pick up Wi-Fi, like a smartphone or tablet. We didn’t do this because we didn’t want to bring an expensive item backpacking, but it turned out to be incredibly expensive to use the internet, or impossible to find any. Yet there is free Wi-Fi in places all around the world, and you quickly realise how often you need to tap in to things like bank accounts or travel bookings. They’re light and multi functional: something to lie on at the beach, a cover for when you’re cold, a towel, a curtain, a skirt, a dress, even an emergency bandage. When flying with small children, bring a laptop/DVD player/tablet. Cartoons and movies while away a sizeable chunk of the flight and allow parents some downtime too. I never travel without my Kindle. No more lugging multiple books around whilst waiting to exchange them with other travellers. This may have been a ‘charming’ part of travelling, but not when every book exchange turns up nothing but books in German! Once you roll, you’ll wonder why you ever bothered to fold. Instead, shop around for best rate. Find a credit/debit card that doesn’t charge for purchases abroad, and don’t bother with traveller’s cheques anymore. The more flexible you can be with your travel plans, the more money you’ll save (you’ll be able to travel at cheaper times and get better rates). To get over jetlag quickly on arrival, try to sync your sleeping pattern with the new time zone immediately. Always take out travel insurance (and don’t rely on credit card insurance alone). It sounds obvious but lots of people don’t bother, and end up losing a lot of money when things go wrong. If you’re looking for ways to get a flight upgrade, then join the airline’s loyalty programme. Even if it’s the lowest level, you still get rewarded first. This Singaporean-made balm not only soothes sore muscles after a lot of travelling but also works as an insect repellent to keep the little biting beasties away. It’s only by traveling that you realise every society is as fractious and plural in their views as your own. Traveling some distance through the air makes you tired, even if all you do the whole time is sit in a comfy seat. If you have a strong urge to ‘go traveling’ or even just to see one specific place, start saving and go for it! Don’t delay. Don’t defer. Just do it, or you will regret it when you’re too old/attached/busy to travel. Be wise and be wary, but try not to be paranoid. I once traveled with a guy who couldn’t relax because he was convinced everyone was out to steal his money or diddle him. He lost his car keys at one point and started blaming the family who had put us up for the night in the desert. He eventually found the keys at the bottom of his sleeping bag. Don’t waste energy getting upset with unseasoned travellers who don’t stand one metre back (or behind the painted line) from the luggage belt, so that everyone can see luggage arriving. I haven’t managed this yet though, and it always infuriates me! To save space and reduce weight, saw your toothbrush in half. The extra three cubic centimeters of space can be used to carry an extra sheet of paper (see tip 2).